Anna Pantelidou, who completed her ECE Ph.D. requirements in February 2009 and is currently a postdoc with her former advisor, Professor Tony Ephremides (ECE/ISR), will become a postdoctoral researcher in the Center for Wireless Communications at the University of Oulu in Finland. 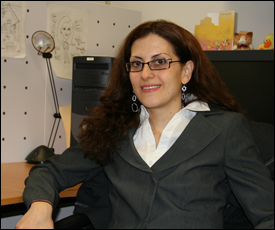 Pantelidou will begin her postdoctoral appointment on Sept. 1 and will hold the position for several years. Ephremides notes that Pantelidou “has formulated and analyzed the so-called ‘scheduling’ problem in ad hoc wireless networks. This is one of the most important and vexing problems that need to be solved if we ever hope to achieve a totally infrastructureless internet. By scheduling we mean deciding which nodes in a wireless network can transmit at each time, since if they all transmit at once the interference to each other's signals will be destructive or will reduce significantly the transmission speed and waste energy. “Anna was successful in analyzing the performance of different scheduling schemes and obtained the characterization of the best such scheme in selected cases which are of interest because they give us insight about the general problem. Her progress has been spectacular in the last year with numerous conference publications, one published journal paper, two submitted ones and an invited one in the making. “At Oulu, Pantelidou will work with Marian Codreanu in Oulu in the group led by Professor Matti Latva-aho. This university, despite its far-north location, is a hotbed of activity in wireless communications with great support from the Finnish government and with many European projects. We continue our bilateral agreement of collaboration with them and thus we may have Pantelidou visit us back from time to time. The people at Oulu have been impressed not only by her work and capabilities but also by her openness and sincerity.